Welcome to the April edition of Pinterest Challenge! This is a group where we actually try the pins we save! I had saved this pin to my Summer Lovin' board and wanted to get started on some of these delightful cocktails. If you don't already, you should follow Summer Lovin'. There are hundreds of fabulous summer ideas on that board! The original maker of this drink was How Sweets Eats and the pin was found here. I love vodka tonics. I was introduced to them by my friend Barb when we were on a long professional development training. They were so good, and as a fan of lime anyway, this became my go-to summer cocktail. When I saw this peach version, I know I needed to give it a try. What's magical about this drink is how the sweetness of the peach mixes with the tart of the lime and the freshness of the mint. The combination in total is refreshing. Be careful, this is a drink that is easy to overdo. It goes down easy my friends, very easy. 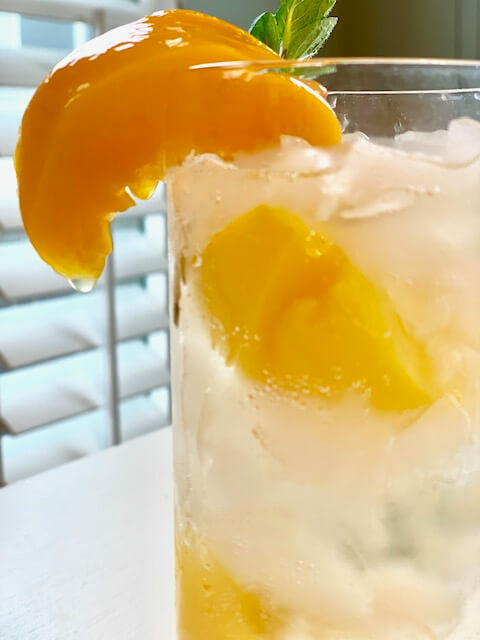 This Peachy Vodka Tonic makes for a refreshing summer drink. In a tall glass, muddle 1-2 mint leaves. Add 2-3 slices of the peach, muddle gently. This would be a perfect drink to sip on when it's warm out. I've always loved peaches. For those people who enjoy drinking something with alcohol included I can see where this would be a summertime drink. Peaches are very popular. Leave out the vodka and replace with Sierra Mist. Still divine. I really love the sound of this for the summer. It sounds like a tasty, refreshing drink that both my husband and I would love as we love fruity drinks. This sounds absolutely perfect for Easter. It's refreshing, cool and I bet it's delicious. This looks so refreshing. I would love to make this for my night girls night in. This looks like a perfect spring drink for anyone that loves vodka. Oh fun! I like that flavor! Summer drinks like this are going to be very nice as it starts to heat up. Now this sounds like such an interesting drink I know so many people who would love it! I'll have to make some for our next get together. This drink looks so delicious and refreshing. I'm not a drinker really, but I would just make this virgin and it would be perfect on a hot day. You are so right. I replace the vodka with Sierra Mist and it is so good! This looks really good! I'll have to make this for my mom this summer, she loves peach flavored drinks. Ohh! This drink looks so tasty! Peach is one of my favorite fruit too! I do not really drink but this sounds great! I think my girl friends would love this! I just love most anything with peaches; they have a definite taste of summer. Pinned. I like having a drink once in a while but I always regret it the next day. Hangover always feel like it's going to kill me. Looks like a great drink recipe. Perfect and just in time for summer! 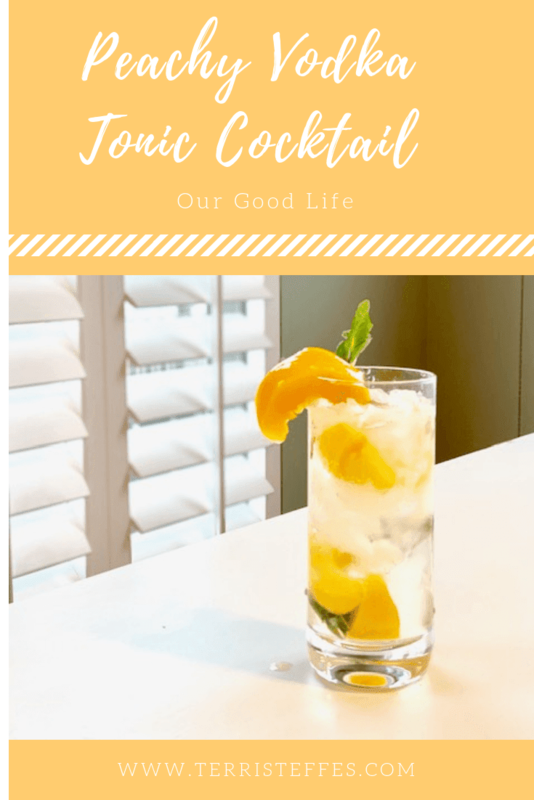 What a great cocktail for spring and summer. I love peaches, but have never tried them with a cocktail. It's on my list now. This looks delicious, did I miss where the lime comes in though? You talk about the tartness of the lime with the peach but I can't see where you add the lime. Thanks. 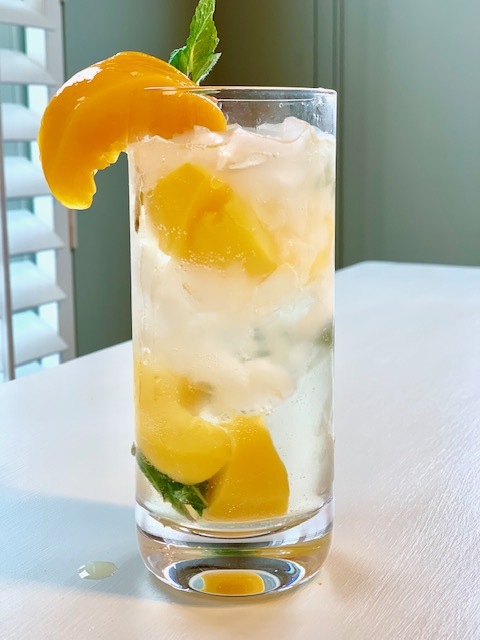 What a great way to use our fresh peaches this summer! Can't wait to try it. Pinned.